Craig Preserve - Haddam Land Trust, Inc. 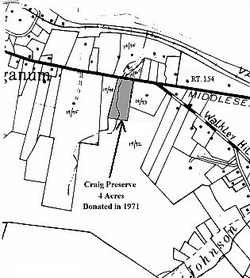 The Craig Preserve just north of Walkley Hill Road in Haddam was donated in 1971 by Alice Craig. It is 4 acres and has frontage on Route 154. There is a small stream running through it from springs on Walkley Hill.